LHT Series | LOR Manufacturing Company, Inc. The LOR Handheld Transmitter (LHT) was designed specifically for industrial applications. The rugged plastic enclosure is dust and water proof (IP65) with a silicone rubber seal surrounding the edges providing impact protection. 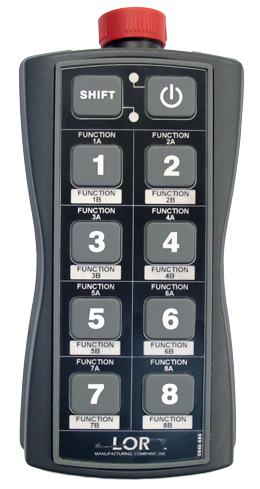 The Transmitter features a rubber keypad with eight (8) function buttons, a shift button, and an On/Off button. All of the buttons provide tactile feedback and are spaced so they can easily be pressed while wearing a heavy work glove. The optional "Twist-to-Reset" Stop button is located on the top of the unit for easy access. With the Shift Key, the Transmitter is capable of controlling 16 separate outputs. Two LEDs embedded in the Keypad provide feedback to the operator for Battery Life and Transmission Status as well as the status of the Shift Key. There are several different receiver options available for the LHT Series to provide the most cost effective solution for your operation. Security System ID and Serial Number provide over 16 million unique combinations.